"The cemetery in Lincoln is situated in a grove of oak trees on a bluff looking out over the rich farmland -- a serene and timeless frame for lives concluded and beyond grieving over." William Maxwell, Ancestors (1971), p. 208. Beyond grieving over perhaps, but surely not beyond remembering and celebrating. The locations identified on the map below are some of the most historically significant in all of Lincoln and central Illinois. Lincoln Memorial Park, Old Union Cemetery, and Holy Cross Cemetery are truly majestic sites that overlook the sweeping flood plains of Salt Creek. As the land rises above the rich fields, mighty oaks shade the playgrounds and final resting places of generations of Lincolnites. 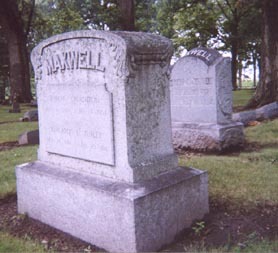 Many of the people on whom William Maxwell based his Lincoln, Illinois-related characters, including his own relatives, rest in the cemeteries here. Below on this page you will find photos of the gravestones of some of the relatives of William Maxwell, whom he wrote about, including his mother (in Old Union Cemetery) and father (in New Union Cemetery). 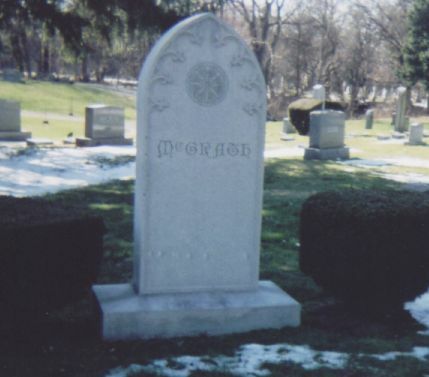 Photos of the gravestones of Dr. Billier Dyer and his sister, Hattie Dyer Brummell, are located at http://findinglincolnillinois.com/foleyhouse.html#dyers. On the homepage of this Web site, I write that Lincoln can be viewed from various angles -- seen from different points of view. Realistic and romantic views are conflicting, but I experience both, depending on what part of Lincoln's history and my experience growing up there I am thinking about. Consequently, various parts of this Web site reflect this dual perspective. This page reflects a part of Lincoln that evokes a romantic view and mood. What do I mean by referring to a part of Lincoln as romantic? To me, a place is romantic that evokes strong emotions, mostly of a positive nature, including patriotism and delight in natural and man-made beauty. A place is romantic that has personal associations and invites reflection. A place is romantic that enables us to understand the ways in which the past creates the present and promises hope for the future. A place is especially romantic when it teaches us how life is ultimately mysterious and even sometimes magical. Poet Vachael Lindsay was painfully aware that in his hometown of Springfield, Illinois, most people were preoccupied with the routines and materialism of daily life and neglected the appreciation of art and nature. Yet he maintained that romance could be found there. With this Web site, I make the same claim for my hometown of Lincoln, Illinois. To discover the romance of Lincoln, visit the places depicted in this Web site, in particular the historic sites. Walk in Lincoln Memorial Park. Roam the cemeteries and observe the markers and note the names of the founding fathers, other prominent citizens, as well as the majority who are lost in obscurity. Walk Cemetery Hill on original pavement of Routes 4 and 66 and enjoy the serenity of nature and the vivid reminders of the past. 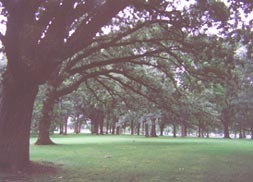 The two-hundred-year-old oaks here are living monuments to the past generations who traveled the railroads and highways in this area, who vacationed at the Chautauqua grounds, who played in Lincoln Memorial Park and on the Elks' golf course, and who rest here forever. Listen closely to the wind above in the tall branches, and you can hear the voices of the past calling you softly to remember -- remember the freedom they enjoyed and their sacrifices that made ours possible. The numbers of the items below correspond to the numbers on the above map. The following numbers and descriptions pertain only to Lincoln Memorial Park, the historic cemeteries, and selected nearby sites. Numbered items on the map that are not included below appear on 12. Route 66 Map & Photos Showing Salt Creek & Cemetery Hill, Including the Highway Bridges, GM&O Bridge, Madigan State Park, the Old Dam, & the Pig-Hip Restaurant in Broadwell. 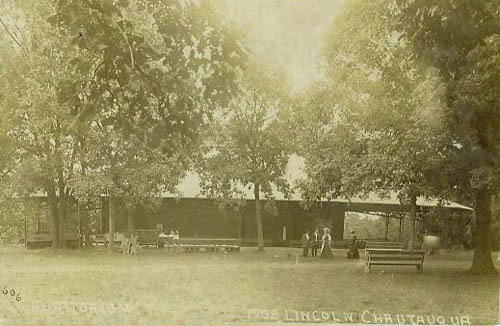 Lincoln Memorial Park is also the former site of the largest Chautauqua village in Illinois (a.k.a Brainerd, or the misspelling Brainard, Park), near Elks' Club Golf Course. 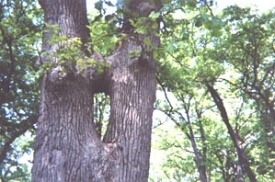 This park is adjacent to and west of the Old Union Cemetery. 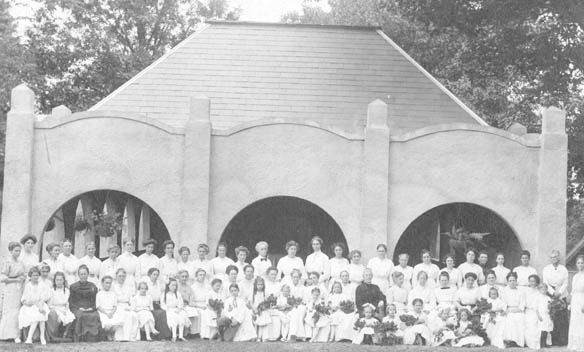 During each summer from 1901 to 1937, citizens from the community and entire region enjoyed various kinds of entertainment here, often spending their vacations at Chautauqua. According to Wikipedia (take it FWIW), "The Chautauqua, (pronounced shə-tô'kwə) was a popular educational movement of the late 19th and early 20th centuries in the United States. Chautauqua assemblies expanded and spread throughout rural America until the mid 1920s. When the Chautauqua came to town, it brought entertainment for the whole community, with speakers, teachers, musicians, entertainers and specialists of the day." In the first decade of the Lincoln, IL, Chautauqua, lectures were presented by such famous speakers as William Jennings Bryan (three-time Democratic Presidential candidate), Evangelists Billy Sunday and Sam P. Jones, Carrie Nation, and Wisconsin Governor Robert M. La Follette. Local orators such as Judge Stringer were also favorites. In later years, pageants and plays were performed. Baseball was always a very popular sport for participants and spectators (Gehlbach, "Chautauqua Summers," p. 3). In some places of the United States in the early part of the 21st century, the Chautauqua movement has somewhat revived, and one of these location is Jacksonville, Illinois. In the best of all possible worlds, a New Lincoln Chautauqua would be formed in Lincoln/Logan County, Illinois. It could be held under a big tent in Lincoln Memorial Park, the original venue and site of the Lincoln Chautauqua. A New Lincoln Chautauqua could provide a great complement to some other local festival such as the National Railsplitter Contest held annually in September, augmenting the coveted heritage tourism in the first namesake town. Judge Lawrence Stringer describes the Chautauqua grounds at Lincoln, purchased from Mrs. Ella Brainerd: "The Lincoln Chautauqua, with its spacious and beautiful grounds of 120 acres, not leased or rented but owned in fee simple, with its magnificent steel auditorium, its scores of handsome cottages, its specialty buildings, its system of water works and sewage, and its extensive equipment of various kinds -- with an investment representing some $50,000 in all -- is differentiated from the ephemeral summer gatherings that oftimes bear the 'Chautauqua' name" (p. 436). He further describes the Chautauqua grounds as "diversified by hills and valley, creek-side and rugged ravine. The platted lots occupy but a fraction of the grounds, leaving ample space for woodland rambles and outdoor sports. The lot portion is arranged in circles, octagons and other geometrical figures, leaving public areas in the camp" (p. 469). The Chautauqua was embraced as a lifestyle by those who could afford it. 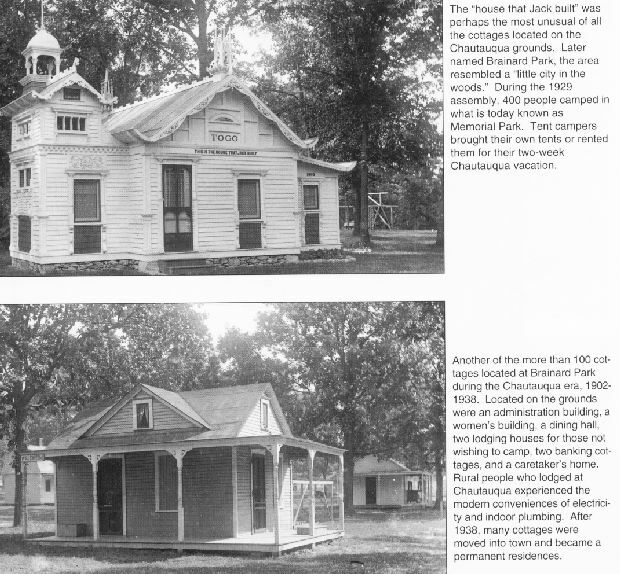 Summer cottages and tents allowed some to live at the Chautauqua grounds during summer months. (Today, no buildings remain.) "For many Logan County people, their vacation was the ten days to two weeks spent at the Chautauqua in August. For farm families, an extra treat was the electricity and indoor plumbing they didn't have at home. In addition to a full-time police force and post office, the grounds boasted a water and a sewage system." 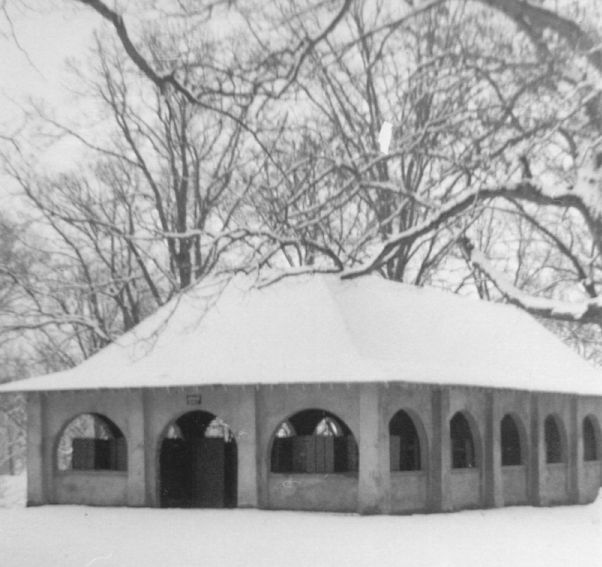 Chautauqua provided a close-to-nature retreat enhanced by city advantages, including telephone service in the administration building" (Nancy Lawrence Gehlbach, "Chautauqua Summers," Our Times, p. 2). 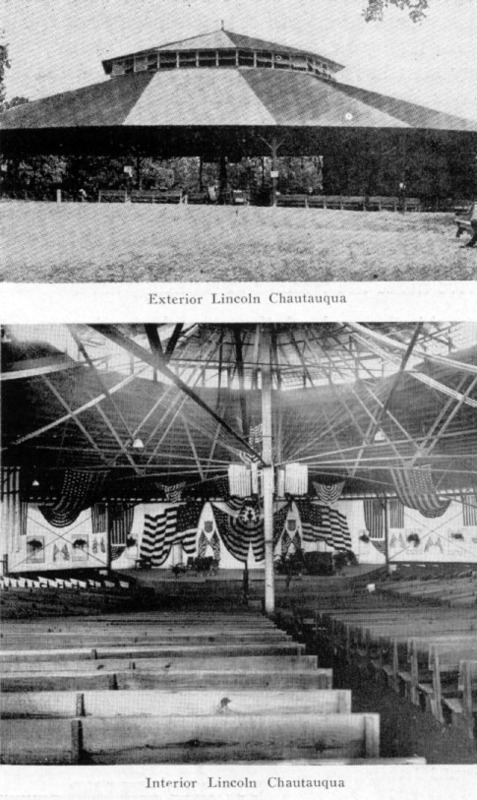 "The Elks Crippled Children's Trust purchased the Chautauqua grounds in 1942 and maintained Brainerd Park until it was sold to the city in February 11, 1960 and renamed [Lincoln] Memorial Park" (Gleason, Lincoln: A Pictorial History, p. 147). 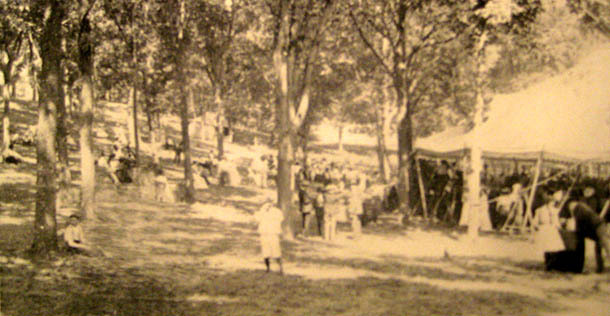 The tent and a parking area for carriages were located just below the hillside on the southeast corner of the Chautauqua grounds (at the edge of the flood plain of Salt Creek). A small lake was constructed in this area, north of the tent. Information about this lake is presented later on this page. Another approach to the Chautauqua tent, parking area, and Brainerd Lake was a road down a gulley located just beyond the west edge of Old Union Cemetery, as depicted below. The above photo at right shows the remnant of the road seen in the above photo at left. I took photo above, right, in June of 2002, jogging down then up the old road back to the car where my wife, Pat Hartman, was waiting patiently. This road was the main entrance in the earliest Chautauqua years. 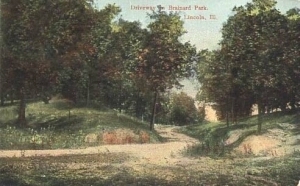 The road is located just west of Old Union Cemetery at the eastern edge of present-day Lincoln Memorial Park, just between the park and Old Union Cemetery. The road winds downhill toward the tent site and the site of Brainerd Lake, gone except for a depression, occasionally soggy, buried in the Salt Creek bottoms at the edge of a cornfield. Darold Henson says that as the Chautauqua developed, the trolley line was extended beyond the depot, so that the the main entrance to the Chautauqua grounds was near the northwest edge of the Old Union Cemetery. The streetcar dead-ended there, near a wading pool. Conductor Ralph Matthews standing on trolley car steps with Motorman Truman Kelson. Note the tent at left. Mr. Aughton worked for the Lincoln Park District in the 1960s when it was creating Lincoln Memorial Park from the former Chautauqua grounds. 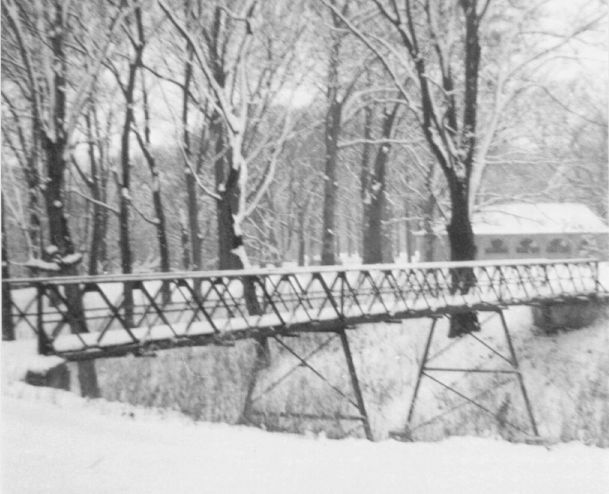 The footbridge picture below was used by passengers after they arrived at the main entrance on the streetcar or from the road parallel to its tracks. William Maxwell describes the arrival of Chautauqua patrons using the streetcar: "Rocking and swaying, the open street-car that all the rest of the year went only as far as the cemeteries now went on to the end of the line. The passengers got off, passed over a narrow footbridge [emphasis mine], and presented their season tickets at the gates of the Draperville [Lincoln] Chautauqua" (William Maxwell, Time Will Darken It, pp. 149-50). Darold said there was a horse barn located behind and to the right of the sign at the left. From the horse barn site, Darold and Judy Henson unearthed the horseshoe seen above. The rusty condition of the horseshoe suggests indeed it has been in the ground for a century. Darold explained that when he was a child, one of his neighbors near Fifth Street was "Oat" Williamson, who kept horses in the Chautauqua grounds horse barn. Williamson's work was excavation and hauling, so he needed the large white work horses for his livelihood. In the mid 1920s, Darold was six to nine years old, and in those years "Oat" sometimes took Darold to the Chautauqua grounds when Oat tended to his horses. Darold remembers riding to the Chautauqua grounds in Oat's Model T.
Note the cabin-style tents at the left of the building. Click on the above image for an even larger picture of just the people (girls, women of various ages, and one or maybe two mama's boys). Once the image opens after you have accessed it by clicking on the above image, you may have to click on the opened image to access the larger version. The above photo is undated but appears to be pre-WW I, the time of the setting for Maxwell's novel titled Time Will Darken It, which includes description of the Chautauqua, as summarized later on this page. Stringer describes the construction of the great steel auditorium: "On March 30, 1904, a contract was entered into with the Decatur Bridge Company of Decatur, Ill., to erect the steel work and concrete foundation of an auditorium building and soon after a contract was let for the lumber construction of the structure and the gravel roofing for the same. The work of construction began at once and the auditorium was ready for occupancy for the sessions of the third assembly, which were held Aug. 11 to 21, 1904. . . . It is a steel framed structure, circular in form 160 feet in diameter, the posts set in solid concrete, seats about 4,5000 people, has a commodious platform and contains but a single interior post. It is located on a hillside and the view is clear and unobstructed. The sides are open to the free circulation of air. It is lighted by electrical lights as are also the entire grounds. The seats are arranged in circular tiers, amphitheatre style, the floor rising from the pits to the sides and rear. The entire cost of the structured complete was in the neighborhood of $10,000" (Stringer, p. 468). In the early years, lectures were presented by such famous speakers as William Jennings Bryan (three-time Democratic Presidential candidate) and Evangelist Billy Sunday. Local orators such as Judge Stringer were also favorites. In later years, pageants and plays were performed. Baseball was always a very popular sport for participants and spectators (Gehlbach, "Chautauqua Summers," p. 3). 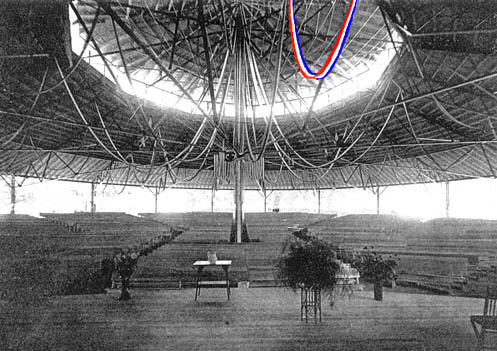 A black and white photo of the Chautauqua auditorium in Dooley's The Namesake Town (p. 43) shows many flags decorating the back of the stage and hanging from the steel rafters. In the above photo, taken by A.B. Bliss, I have "painted" one of the ceiling streamers to suggest the powerful effect of the patriotic colors that adorned this impressive facility. In William Maxwell's Time Will Darken It (1948), Chapter 11 is a literary portrait of the Chautauqua in 1912. Maxwell mentions the "ice cream tent, the women's building, the administration and post-office building, the dining hall, and the big cone-roofed auditorium, built of the brow of a hill and open on the sides to all kinds of weather" (p. 150). He also describes a group of circles on which the various cottages were located and suggests why some Lincolnites used them during the summer: "The cottages were occupied by the same families year after year. They did not come for the simple life -- life being, if anything, too simple in town. They came for self-improvement, and because it was a change, with new neighbors and unfamiliar china and kerosene stoves to worry over and a partial escape from the heat" (p. 150). In this novel, the main character, Attorney Austin King, comes home from work and drives his guests from Mississippi, the Potters, to the Chautauqua grounds, where they were entertained by "the White Huzzars," a group of "twenty handsome young men" playing lively music: "perhaps they were the instruments of Change, pointing towards the fast automobiles, the golf courses, and the Sunday-night movies of the future. . . . The grey-haired members of the audience, guardians of a gentle Calvinistic [Puritanical] era and with fixed ideas of what entertainment was appropriate to a day of worship sat shocked and disapproving. The rest applauded wildly, reminded of something they had almost forgotten or known only in snatches -- of how wonderful it is to be young" (p. 150). In the evening on the return drive to town, Austin King makes the attractive, young Nora Potter, who is holding Austin and Martha's daughter in her lap, promise him that before she marries, she will introduce her fiancé to Austin. At this point it is unclear whether Austin knows that she has feelings for him. In just a few pages preceding this scene, "she [Nora] was conscious of no other presence in the house but his [Austin's]. And when his grey eyes came to rest on her for a moment, they left her so drained and weak that it was all she could do to stand" (p. 145). You really should read Time Will Darken It to find out whether Nora takes Austin away from his wife and daughter. 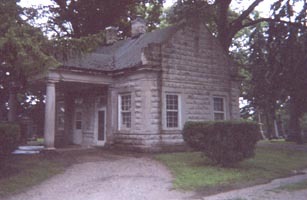 In Ancestors, Maxwell writes that his parents built a cabin at the Chautauqua grounds, shaded by four large oak trees, when he was about three years old (1911-1912). Maxwell says his parents selected a location "on the extreme outer edge of the Chautauqua grounds, far away from the big cone-shaped open auditorium, and William Jennings Bryan, and the string quartets, and the Anvil Chorus; away from the cooking classes, and the wading pool [at the entrance near the footbridge], and the afternoon baseball game; away from the log-cabin museum [emphasis mine] crammed with objects very much like the things that were auctioned off when my Great-great-grandfather Turley died, except that the metal they were made of was now green and mysterious with age; away from the tent stakes that were so easy to trip over, and the invitations you could not say no to -- away from people is what my father and mother had in mind, but Jimmy Hoblit and his wife came and settled down right beside them" (p. 260). How many antiques can you identify on the porch? A tent appears in the background at right. Maxwell describes the leisure of evenings marked by solitude in which the initial pleasure of relaxed conversation can eventually be displaced by the discomforts of boredom and nettlesome insects: "sitting on the porch in the evening, we burned punk to keep the mosquitoes and gnats away and passed the citronella around. The katydids were deafening" (Ancestors, p. 260). This scene is near the entrance of the Lincoln Memorial Park. A close-up view of the photo (with magnifying glass) reveals the present-day house at the back left and several cars parked on the road between the house and the Chautauqua Grounds. The building most noticeable at the back right is the Old Settlers Museum. To its right is the Administration Building. Several WW I veterans attended as indicated by the men in uniforms. The photo caption in Mr. Gleason's book reads, "A meal was served at Brainerd Park following the 1919 'Welcome Home' parade. More than 20,000 people attended the parade and the events at the park. Food committees worked through the school districts to provide potato salad, fried chicken, veal loaf, slaw, baked beans, pie, cake, and sandwiches." Photos circa 1960s courtesy of Willie Aughton. The photo above at right shows the present-day Lincoln Memorial Park entrance sign at the left (and the residence across the street from it). 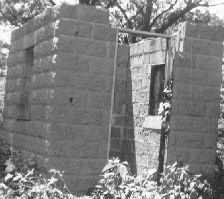 The concession stand has been demolished due to the advancement of civilization, or is it the disuse and the timeless vulnerability to barbaric vandalism?. 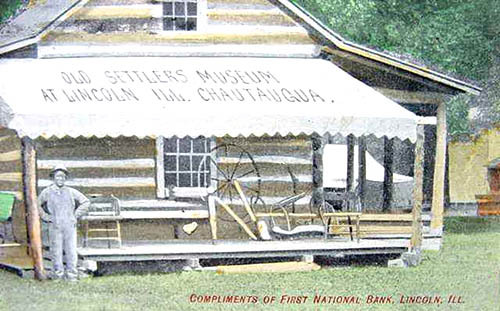 The Lincoln Chautauqua had approximately 100 cabins. None remain there today. Many were removed to Lincoln Lakes. Other cottages were scattered throughout Lincoln. Some were "moved to the Melrose addition near the fairgrounds by George White" (Gehlbach, "Chautauqua Summers," p. 3). This item was for sale on eBay, and the seller describes the card as follows: "This is a 4 5/8" by 3 1/2" business card, probably from 1920 or earlier, featuring a beautiful little summer cottage with a rustic gazebo to the left. 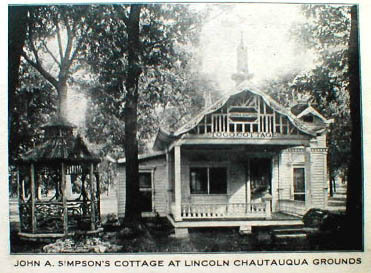 The caption reads 'John A. Simpson's Cottage At Lincoln Chautauqua Grounds.' On the back is printed the following: John A. Simpson, Architect, General Contractor -- Estimates Furnished on Short Notice - Telephone 67, Lincoln, Illinois. He was apparently so pleased with his little cottage that he incorporated the picture of it with his business card as a clever advertisement of his abilities. The cottage is wonderful, with gingerbread trim and turned-up eaves, and a nice front porch (a dressed-up bungalow!). The gazebo is made in the Adirondack style, of natural twigs and branches." The John. A Simpson company was a long-time provider of professional design and building services in Lincoln. While glancing at Paul Beaver's Logan County History 1982, I noticed a photo of the first Lincoln Christian Church, built on Pekin Street; and a notation on the photo said that the church was built in 1856 with John A. Simpson as the architect and that the church was "wrecked" in 1903 (p. 134). While looking at Paul Gleason's Lincoln: A Pictorial History, I saw a photo of the construction of the building that housed Avery and Comstock's Furniture Store, Boss Drug, and the Vogue Theater; and there was a large sign across the front of the unfinished building that said, "John A. Simpson, Arch't & Builder Lincoln, Ill., Plans Furnished on Short Notice" (p. 76). 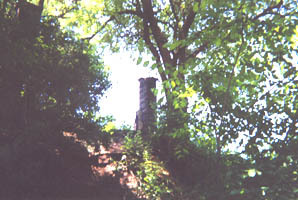 The first image below presents another view of Simpson's cottage. Note: the caption for this image says that Chautauqua Grounds were later renamed Brainerd Park. I question this statement: as indicated above on this page, the Brainerds had owned this property, and Mrs. Brainerd sold it to the Chautauqua Association. This property may have thus first been known as Brainerd Park. "In 1907, a bayou of Salt Creek was deepened and widened and converted into an attractive lagoon, surrounding a wooded island" (Stringer, p. 469). This "lagoon" became known as Brainerd Lake. On the shore of Brainerd Lake, William Maxwell's main character, Mildred Gerrett, in "The Trojan Women" rented a cottage to escape her unhappy marriage. The photo at left below shows the 1907 construction of Brainerd Lake by dredging the backwater of Salt Creek at the foot of the ridge forming Cemetery Hill. The photo above at right is from Gleason, A Pictorial History of Lincoln, p. 147. The caption reads "Oldham Paisley and Leland Miller spend time at the lake at Brainard [sic] Park. 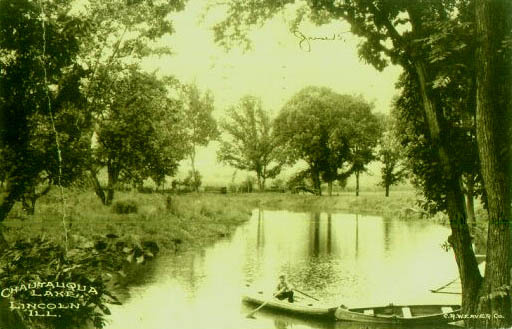 In 1907, the lake was dredged from Salt Creek so that Chautauqua participants could fish and canoe." Note the clear-water reflections in the photo above at right. Lincoln-area lakes formed with muddy water from Salt Creek become clear as sediments settle. The intricate shading of this picture suggests the work of a French impressionist. 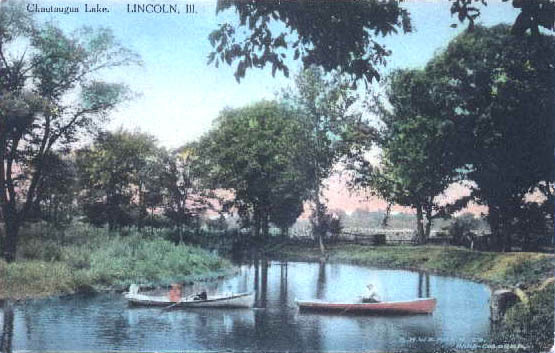 In an email communication with me in the fall of 2007, Priscilla Florence says that while she was viewing this community history Web site of Lincoln, Illinois, she recognized this picture postcard image of the lake in Brainerd Park (Chautauqua site) as a scene also painted by Bessie Dyer, wife of William Dyer, M.D., the central figure of Maxwell's narrative titled "Billie Dyer." 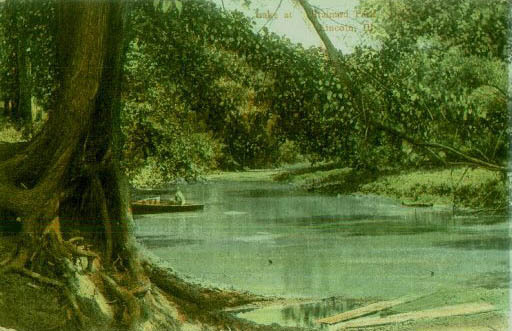 Ms. Florence mentioned that boys from Lincoln, including William Dyer, used to swim in this lake and that Ms. Dyer's painting shows two black youths, one presumably being William Dyer. Each side had several spigots with pipes coming from the central block and the trough catching the overflow. 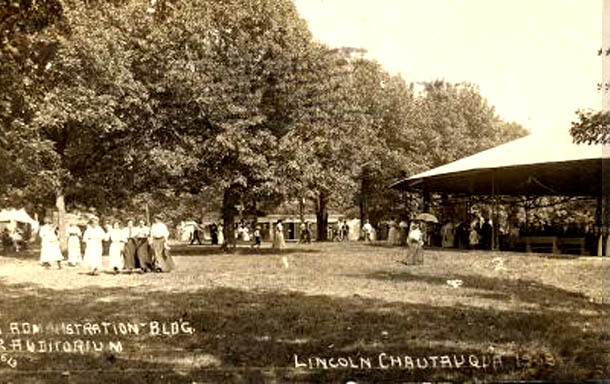 Few traces remain in Lincoln Memorial Park of the Chautauqua period. 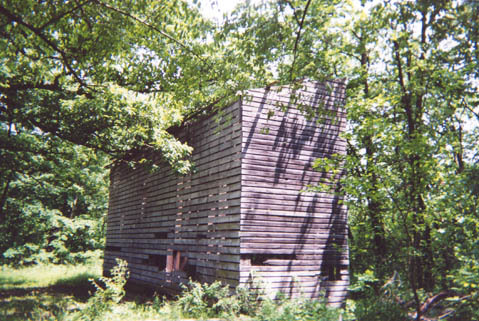 The corn crib rests on a thick concrete slab on the rise above the former Brainerd Lake, and the boards appear to be made of oak. It stands as a rustic monument to the prosperity of the farm life that has always made civilization possible in Lincoln, Illinois, including the Chautauqua and Lincoln Memorial Park. "See the glorious corn! Look on its ripening, waving field! See how it wears a crown, prouder than monarch ever wore, sometimes jauntily and sometimes after the storm the dignified survivors of the tempest seem to view a field of slaughter and to pity a fallen foe. . . . Aye, the corn, the royal corn, within whose yellow heart there is of health and strength for all the nations. Corn triumphant, that with the aid of man hath made victorious procession across the tufted plain and laid foundation for the social excellence that is and is to be" (p. 627). Is this the origin of the expression, "That's 'corny'?" 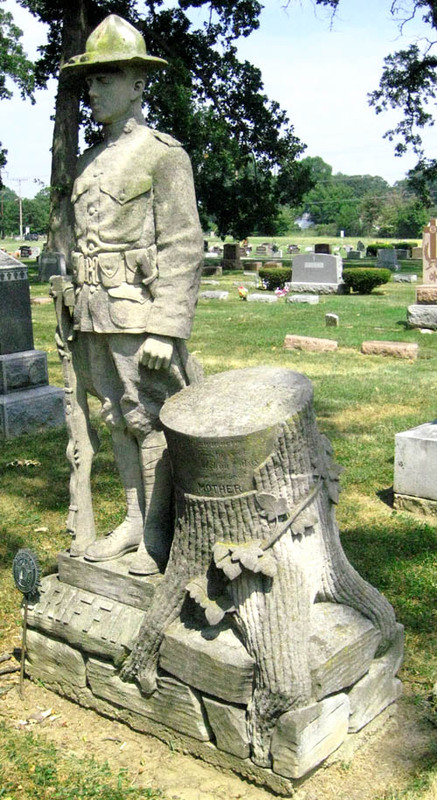 This Civil War Monument is described by Judge Stringer: "In Union Cemetery at Lincoln, there has also been mounted on a carved stone carriage, a large field piece, contributed by the government, with a pyramid of 100 shells, the whole resting on a stone slab, upon the lot owned by Leo W. Myers, Post, G.A.R. The cost of transporting and mounting the cannon was borne by the local Post. This memorial was dedicated September 16, 1900" (Stringer, History of Logan County, Vol. I, p. 209). 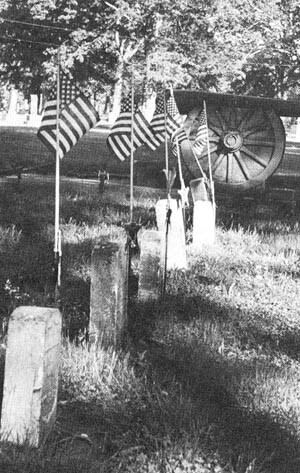 The cannon balls and the cannon are now gone, while the concrete cannon wheels, star-shaped flag holders, and gravestones remain. This site is near the old streetcar depot. A main cemetery road runs nearby, allowing easy access to this area. 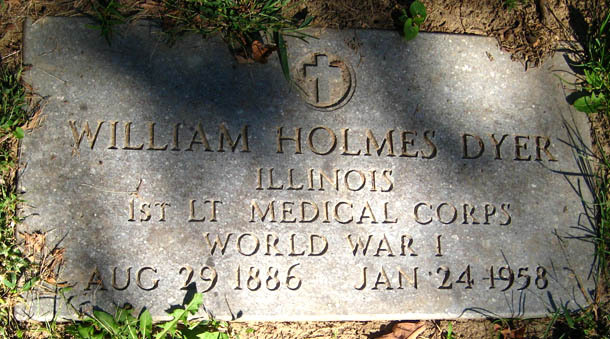 Source: http://www.illinoishistory.com/csa-veterans-illinoisburials.htm. This source identifies other cemeteries in Logan County, IL, where Confederate soldiers are buried. 3. Historic Streetcar Depot. 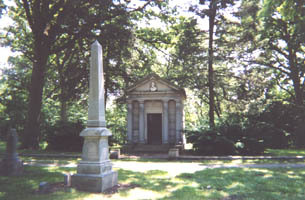 Located at the north central edge of Old Union Cemetery near the Civil War veterans' graves and memorial. "The streetcar line started at the New Latham Hotel and ran past the baseball park and the county jail, past the state insane asylum, and on out to the cemetery and the lake. . . . The people [riders] who had flowers. . .rode as far as the cemetery where, among acres of monuments and gravestones (Protestant on the right [Old Union Cemetery], Catholic on the left [Holy Cross Cemetery]), faded American flags marked the final resting place of those who had fallen in the Civil or Spanish-American wars. It was a mile farther to the end of the line. . . .
A winding path through the oak trees led her eventually to a cottage resting on concrete blocks, with a peaked roof and a porch across the front, facing the lake" (William Maxwell, "The Trojan Women," pp. 42-3). Life at the cottage has its challenges for Mildred: she contends with a flying squirrel that invades the cottage at night and is afraid of the water moccasin that slithers under the front porch. The townspeople gossip about whether she will return to her husband. This is at least the third time she has left him. How is this separation affecting her children and her husband? What is she really like, and why does she leave him? Is she vain and insufferable, or is she abused? Or both? By reading "The Trojan Women," you'll be able to formulate some logical answers. In the above photo, the streetcar approached from the left background. 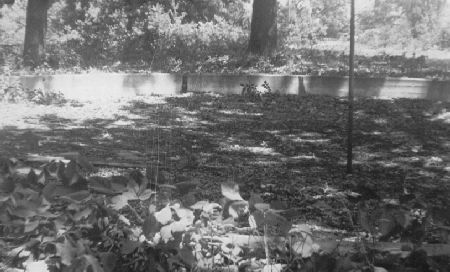 The tracks were parallel to the south fence of the Lincoln State School & Colony, extending west from south State Street. In the above photo, the streetcar would have run between the cornfield (left background) and the cemetery. 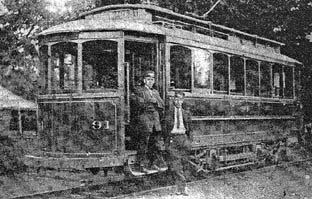 After a stop at the depot, the streetcar would have continued (left in the photo) about a quarter mile to the Chautauqua grounds before making the return trip to town. The streetcar ran either forwards or backwards and required no special track alignment to turn around. When the streetcar ran so many years ago, the depot was open -- no walls: it consisted only of a red tile roof (original roof shown in the photo) supported by stone columns. 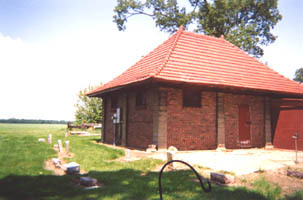 The sides were bricked in later when the cemetery association began using this building for storage. 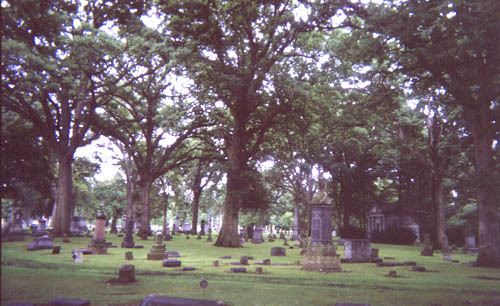 The depot is located on the northern edge of the cemetery and its giant oaks, whose shade covers some of the graves and tombstones in the foreground. 5. Postville Park. Shown and described in 1. Abraham Lincoln and the Postville Courthouse. 6. Route 66 Bypass/Beltline. Completed before WW II; see 8. Route 66 Overview Map of Lincoln with 42 Sites, Descriptions, & Photos for the entire route. 7. The Mill Restaurant and Home of the Schnitzel. Shown and described on 8. 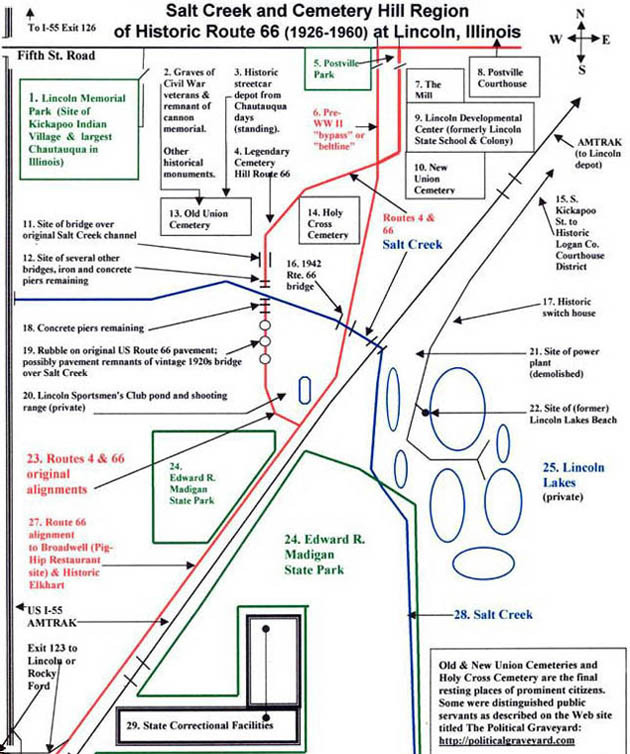 Route 66 Overview Map of Lincoln with 42 Sites, Descriptions, & Photos. 8. Postville Courthouse. Shown and described on 1. Abraham Lincoln and the Postville Courthouse. 9. Lincoln Development Center. Formerly the Lincoln State School & Colony and prior to that the Illinois Asylum for Feeble Minded Children. Closed September 1, 2002, after 125 years. See 27. Lincoln Developmental Center (Lincoln State School & Colony in the Route 66 era), Plus Debunking the Myth of Lincoln, Illinois, Choosing the Asylum over the University of Illinois. 13. Old Union Cemetery. Located on west side of original Routes 4 & 66 pavement. Entrance near the barricade at Cemetery Hill. Access an article that describes the origin of Old Union Cemetery (Lincoln Evening Courier, Aug. 26, 1953, section 1, p. 9). Once this article opens in a new widow as a JPEG, you may have to click it again to re-size it for readability. This article was found and generously provided by Gary and Pat Freese of Lincoln, Illinois, in October, 2007. (Photo from Stringer, Vol. I, opposite p. 578). 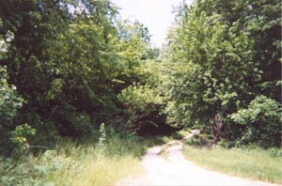 The photo above at right looks north at original Routes 4 and 66 pavement at the top of Cemetery Hill. 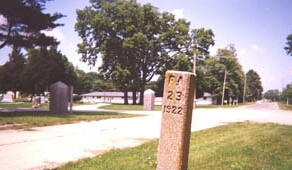 A 1922 Route 4 right-of-way marker is in the foreground. 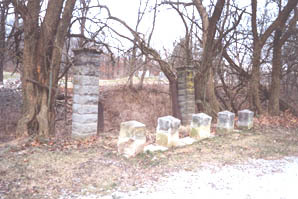 The center background shows the entrance to Old Union Cemetery, at left, with two of the same pillars as seen in the above left photo. The road center right connects to the entrance to Holy Cross Cemetery; then shortly after, this road crosses the 1940s Route 66 beltline. In the background is the section of red brick pavement (original Route 4) known as Cobblestone Avenue. This building was originally the chapel, where many funerals were held. 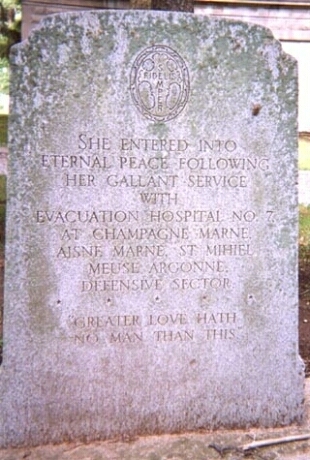 11.51: Back of Nurse Dunlop's Stone Listing Sites of Evacuation Hospitals Served and Tribute: "Greater Love Hath No Man Than This." Scenes in two of William Maxwell's books are set in Old Union Cemetery, and these scenes are occasions for him to describe family members who shaped his personality, values, and beliefs. In The Folded Leaf (1945), he describes visiting the cemetery with his father. In his nonfiction book titled Ancestors (1971), Maxwell describes visiting this cemetery with his mother. In The Folded Leaf, the main character, Lymie Peters, is based on the author as an undergraduate at the University of Illinois. Chapter 19 is devoted to an account of Lymie's annual return to his hometown to visit the grave of his mother, accompanying his father, on the anniversary of her death on March 10. Lymie remembers the gift of his mother's love. Regrettably, though, he cannot recall her face. The father eulogizes his wife: "your mother was a wonderful woman. . . . I didn't know what I was getting when I married her. She was just young and pretty and always laughing and tying ribbons in her hair and I knew I had to have her. But that wasn't what she was really like at all, and it was quite a while before I found out" (Folded Leaf, p. 90). William Maxwell's father told his son that while sitting in church he looked around at others and "was so proud of your mother -- of the way she looked and all that she was -- and I broke out in a sweat at the thought of how close I'd come to marrying another woman" (Ancestors, p. 193). In Ancestors, Maxwell describes going to Old Union Cemetery with his mother when he was a child. Recalling this experience, Maxwell reflects on his maternal grandfather, Attorney Edward Dunallen Blinn. "From the winding cinder drive I read the names on the tombstones. The cemetery was a replica in a few wooded acres of the town, for the names that constantly occurred in the conversation of my elders were all here. . . . The graves were not neglected, and the dead were not forgotten but only a little removed from the heart of things." "She [Maxwell's mother] let me fill the vases with fresh water from the nearest faucet, and as she arranged the flowers she had brought from the garden at home she would talk to me in a voice pitched a little lower than ordinary, making me feel the presence of the people all around us in their graves. . . ."
"Throughout the cemetery there were flags, some bright, some faded, in star-shaped metal standards, marking the graves of those who had fought in the Spanish-American or the Civil Wart. I loved all flags" (Ancestors, p. 208).
. . . "Do you remember your [maternal] Grandfather [Judge Edward Blinn]?" "The sadness I hear in my mother's voice makes me search around in the back of my mind for something that turns out not to be there. I feel that she will be distressed if I say I don't remember him, and so I manage to conjure up a shadowing figure (as in six or seven years' time I would be calling on recollection for what she looked like). "I remember him coming up the street," I say. I am aware that the image is perhaps invented, and I expect she was too." "When I study his picture -- the fine forehead, the line of the jaw, the mouth half concealed under a drooping mustache, and the eyes, particularly the eyes, which I know so well because I have know them all my life, they are just like Annette's [his aunt Annette Blinn] and they have looked past me so often with just that expression, as of someone staring at life itself -- I regret deeply that I cannot remember him. It is the picture of a man of intelligence and feeling, with a vein of sadness running through his nature, and a commitment to various abstractions, including honor" (p. 209). 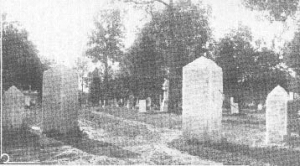 Many of the Blinn family are buried in Old Union Cemetery, as are members of the Maxwell family, including William Maxwell's Grandfather Robert Creighton Maxwell, who died before William was born (Ancestors, p. 1). The tall stone in the background identifies the Blinn family plots. The stone sits on a ridge above a steep slope that drops to the original channel of Salt Creek, which still holds water. 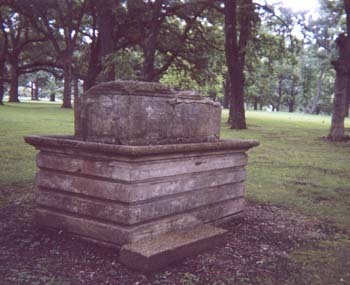 The tall stone's inscription near its base reads simply "Blinn." The stone in the left foreground marks the grave of William Maxwell's mother, Blossom Blinn Maxwell (1881-1919). 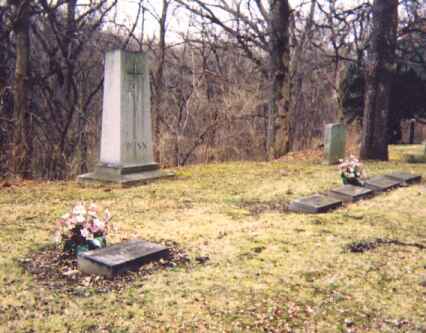 The other stones from left to right mark the graves of Edna Skinner Blinn (1895-1966); her husband, William Maxwell's Uncle Edward "Ted" Blinn (1888-1952); and William Maxwell's grandparents, Annette Youtsey Blinn and Edward Dunallen Blinn. The plastic flowers are somewhat faded but clearly indicate the tribute of descendants. William Maxwell's Grandfather Robert Creighton Maxwell was also a successful, respected lawyer in Lincoln, Illinois. Maxwell says that his Grandfather Maxwell "was a very competent office lawyer -- that is, he examined abstracts, wrote wills, and was engaged in the probate practice" (Ancestors, p.142). 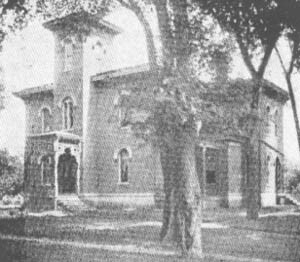 The Robert Maxwells sold the farm Mrs. Maxwell had inherited from her mother, and they used to money to move from a small house on Pekin Street behind the county jail to a larger house on north Kickapoo Street. William Maxwell's description of the Maxwell house on Kickapoo Street is given at 30. Neighborhoods with Distinction. The Robert Maxwells were devout members of the Christian Church. "The controversies that the Disciples of Christ were expending so much heat and energy on during this period were all thrashed out at the family dinner table, especially when some visiting preacher was bedded down on the couch in the parlor. . . My grandmother never stopped talking about immersion, or thinking about it. She kept track of who was and who wasn't. She had the makings of an evangelist" (p. 144). William Maxwell implies that the strictness and religious intensity his father knew as a child alienated him from organized religion. 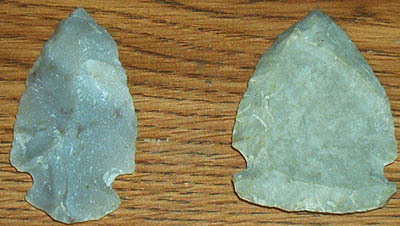 As indicated at 21. Churches, the son, Author William Maxwell, also developed strong independence of religious thought. As lawyers, both of William Maxwell's grandfathers' paths crossed at least once, as they were on opposite sides of a famous case. It was concerned with an inheritance dispute over the estate of John D. Gillett, one of Lincoln and Logan County's most prominent and wealthy citizens. William Maxwell estimates the estate was worth the equivalent of five to six million dollars in the early 1970s, when Ancestors was published (p. 161). The several Gillett children divided into two factions associated with two of the children: Emma Oglesby (wife of the governor) and Miss Jessie Gillett. Maxwell says the details of the case were so complicated as to defy comprehension. Grandfather Maxwell represented Jessie Gillett, and Grandfather Blinn represented Mrs. Oglesby. 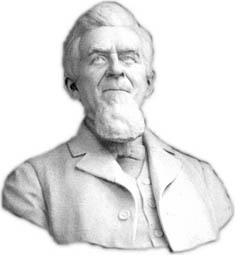 "My grandfather Blinn won the case, who didn't need to win it. . . ." Even so, "it was the first case my Grandfather Maxwell ever had where the fee was substantial, that the part he took in the trial considerably enhanced his reputation, and that if he had continued to be Miss Jessie Gillett's legal advisor he would no longer have worried about the bill from Boyd's Dry Goods Store. 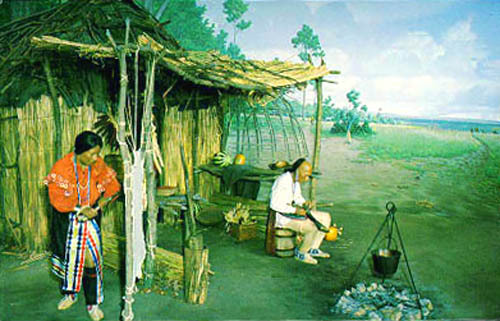 Instead his health broke down" (Ancestors, p. 161). Both Robert C. Maxwell and his older son, Charles C. Maxwell, died early, tragically: the son at just 26 of typhoid, preceding the father. 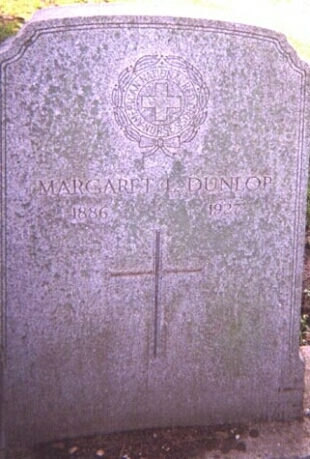 The father passed away in 1904 at the age of 54. Charles C. Maxwell had become first a law partner with his father and then an insurance underwriter. 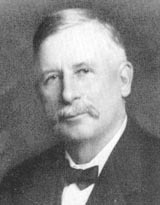 Author William Maxwell's father, William Keepers Maxwell, Sr., took over his older brother's insurance activity, which led to a successful career in the insurance business. William Maxwell quotes the published obituary of his Uncle Charles C. Maxwell: "The death of Charles C. Maxwell removes from Lincoln one of its most promising young men, one widely admired by all who knew him. Full of energy, pluck, and stick-to-it-iveness, he had begun a foundation that was, even in early life, an marvel in itself" (Ancestors, p. 157). Maxwell writes of his Grandfather Robert C. Maxwell: "Every human life is a story, and my grandfather's story as his wife and children understood it, was that he was taken ill just as he was about to make a killing. They didn't use this vulgar modern expression, but nevertheless it was what they meant. He hadn't been as successful as he deserved to be. And to the end of their lives, whenever they spoke of him, their voices were tinged with an unfading regret" (Ancestors, p. 166). By reading Ancestors, you will enjoy portraits of other interesting members from both sides of Maxwell's family. Seen from the roadbed of Routes 4 & 66, this is a stone column at the eastern edge of old Union Cemetery. Another stone column like it and iron posts stand a few feet to the left and are hidden by the bushes. These columns and posts are approximately 75 feet south of the cemetery entrance. Iron posts can be seen just inside the stone columns. Behind these columns is the cut in Cemetery Hill with the roadbed of Routes 4 and 66 at the bottom. Holy Cross Cemetery is in the background. Were these structures part of a bridge between the cemeteries, and if so what kind of bridge: vehicle or pedestrian? Was just reading on your site about the 2 cemeteries and possible "bridge" connecting them. I had asked Willard Warrick (96 years old and very accurate!) about this last year as I was doing the cemetery walk for LCGHS [Logan County Genealogical & Historical Society]. He told me BEFORE Route 4, as in the days of the covered bridge, that road near the cemeteries was "even," so no bridge existed, just a gate type entrance to each cemetery. I cannot imagine how steep that road would have been, but he insists that the road was "cut down" when that became route 4 before 66. Just thought I would pass that information along and perhaps someone else can verify it or totally discount it. This information makes good sense because just opposite the columns and posts in Old Union Cemetery, there is an indentation in the hill leading up to Holy Cross Cemetery, and I recall as a kid seeing some structures there, which I had mistaken as bridge remnants. 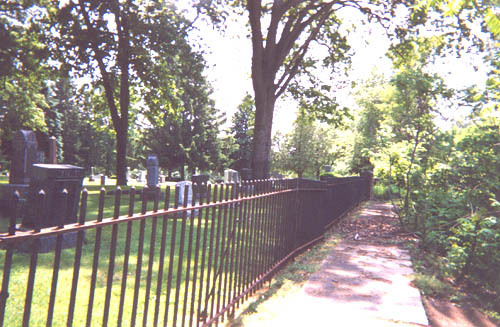 Immediately to the right of the fence and sidewalk and parallel with them is the cut in Cemetery Hill created for Routes 4 and 66. The far end of the sidewalk is the point directly across from the structures pictured previously at the eastern edge of Old Union Cemetery, which is to the right of the above photo. In every cemetery sleep the distinguished and the obscure, the virtuous and the villainous, the fortunate and the unfortunate. Sometimes they even sleep side by side, whether as relatives or strangers. The living have always wondered how well the dead sleep. Some believe that spirits of the unhappy and unfulfilled sometimes leave their graves, whether to roam restlessly or torment their oppressors. As in any cemetery, buried in Old Union Cemetery, Holy Cross Cemetery, and New Union Cemetery are those who would have reason to feel wronged: the victims of every possible misfortune from death caused by stillbirth and disease to death by accident (including those on "Bloody 66" nearby), and the most heinous crime of murder. William Maxwell's So Long, See You Tomorrow (1980) tells the true story of a murder in the early 1920s that occurred in the Lincoln area. Clarence Smith's neighbor and best friend, Lloyd Wilson, has an affair with his wife. As a result, Clarence suffers financial ruin and heartbreak from this double betrayal by wife and best friend. In a mixture of revenge and desperation, Smith kills Lloyd Wilson, then commits suicide. Clarence's older son, Cletus, and William Maxwell were playmates. After the murder, Cletus moved away, but several years later the two boys had a chance encounter in a Chicago high school, and Maxwell was haunted by his failure to speak to Cletus as they passed in the hall. The novel tells the harsh story with uncomplicated directness, yet subtly explores the themes of coming of age and the ways we view experience with the passing of time. 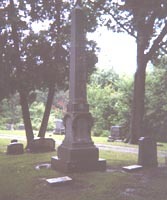 Many of William Maxwell's relatives and friends rest in the three cemeteries of this immediate area. Some of these relatives and other acquaintances are the prototypes of characters in his writing. 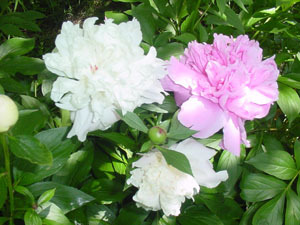 Do some of the real-life counterparts of So Long, See You Tomorrow also sleep here, and if so do they sleep peacefully? "Probably one of the boldest crimes ever committed in Logan County was the assault and robbery, in broad daylight, on the streets of Lincoln, on March 25, 1908, of one of Lincoln's best known and wealthiest citizens, Frank Frorer. 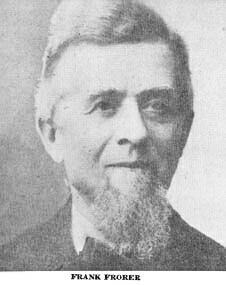 Mr. Frorer was born in Germany in 1832 and came to Lincoln, at its inception as a town, in 1853. He began as a clerk in a hardware store, later establishing a similar store of his own. By economy and perseverance, as well as judicious investments, he gradually accumulated considerable property. At the time of the robbery, he was President of the First National Bank and a part owner of what was known as the South Coal Shaft. For a great number of years, Mr. Frorer had looked after the payment of the miners at the coal shaft and it was his custom to ascertain the amount needed to pay the men on pay day, driving to the First National Bank, with an open wagon, loading in the amount of currency needed, in a chest used for that purpose, and carting the money, in this manner to the office at the coal shaft for distribution to the men. He rarely ever was accompanied by anyone and did not even take the precaution of arming himself" (Stringer, pp. 358-359). History is often not easy to determine. The preceding states that Mr. Frorer was in the habit of delivering the payroll alone. Yet, other information suggests that Mr. Frorer did not typically deliver the payroll, whether alone or accompanied by another. According to an article in the Lincoln Evening Courier, Logan County centennial edition of 1939, "for 22 years [black] Wilson Russell was employed by the late Frank Frorer and for years carried the company pay-roll to the South mine prior to the day when Mr. Frorer himself was driving the pay-roll and was robbed and fatally injured" (p. 1). Stringer's narration continues: "On March 25, 1908, he [Frorer] drove up his open wagon to the bank, as usual, the hour being about two o'clock in the afternoon. He had counted out and placed in the chest, about $5,000, in gold and silver currency. This he loaded into the wagon and drove toward the south shaft. At the corner of Third and Maple Streets, a man ran out into the road and jumped into the wagon and before Mr. Frorer could realize what was taking place, drew a loaded "billy" from his pocket and struck Mr. Frorer a blow on the head. Mr. Frorer collapsed in the bed of the wagon, another man came running up and the two men gathered the money chest and started north with it, in the direction of St. Patrick's church, Mr. Frorer being unconscious all the while. Mr. Russell for 22 years was the coachman for the Frank Frorer family. He is at the right in this photo. Unfortunately this photo was of poor quality, and the paper has a crease. The other occupants of the carriage are unnamed but presumed to be members of the Frorer family. 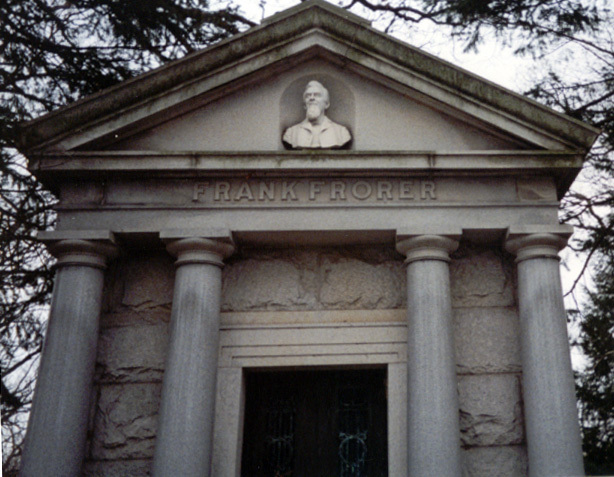 Do they all rest in Old Union Cemetery as does Frank Frorer? William Maxwell says that the whites were willing to share doctors, the drinking water, and the cemetery ("Billie Dyer," p. 9). "The late Wilson Russell. . .used to recall a raid by Yankee soldiers on the Logan County, Kentucky, plantation where he was born in slavery in 1856. His mother hid him in a manger in the barn until the Union soldiers had departed. 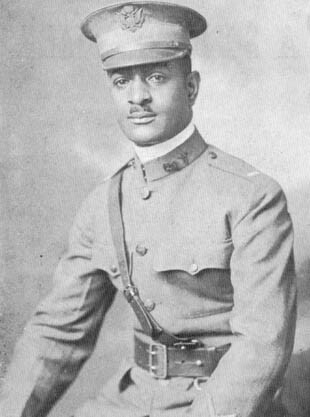 Mr. Russell also recalled when his father Wilson Russell, Sr., took his family overland to Kansas and how a sister died enroute and was buried behind a log on the roadside." Here a third man was located with a livery rig. The chest was loaded into this rig and the thee men drove northward through the city, and out upon the Atlanta road. On recovering consciousness, Mr. Frorer came back to town and gave the alarm. The sheriff and police started in immediate pursuit of the robbers. At the Nicholson farm, just north of town, they found where the men had abandoned the rig, taking to the fields, believing the chances of escape much better than in the beaten highway. The authorities returned to town and secured an automobile, with which they started in a northeasterly direction. When five or six miles out from town, they met two men, whose conduct was suspicious, and these they arrested, brought to town and lodged in the county jail. These suspects were Elmer Highfield and Fred Ramelow. They were subsequently identified by the Springfield police as known in that locality. 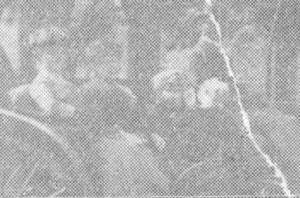 Two or three days later one John Kennedy was also apprehended, as being connected with the assault. All three were indicted for robbery and on May 26, 1908, pleaded guilty and were sentenced to the penitentiary. Mr. Frorer was never the same man after this assault. 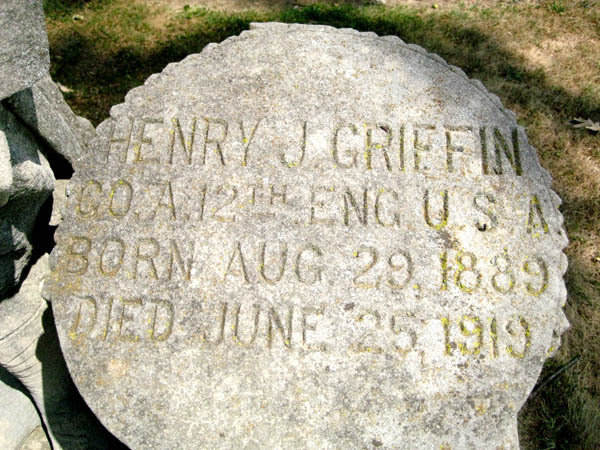 His health gave way and on June 8, 1908, a little over two months after the assault, he died. Later, Highfield was paroled from the penitentiary and turned state's evidence, implicating, with Kennedy, Ramelow and himself, one William Webber. Webber was a Lincoln man, who had previously pleaded guilty to burglarizing a business house in the city and who is also serving sentence in the penitentiary. All have been indicted for the murder of Mr. Frorer and their hearing on this charge is awaiting their discharge from the penitentiary, after the expiration of their present terms" (p. 359). Frank Frorer was one of the founders. In 1888 the principal stockholders were Frorer and D.H. Harts, Sr.; in 1905 D.H. Harts, Sr., was joined by his son, D.H. Harts, Jr., and Walter Puterbaugh as directors (Stringer, p. 542). 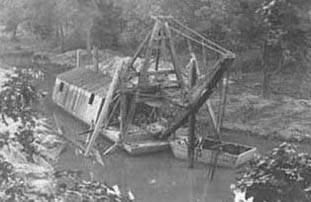 The mine was located near the present intersection of Second and Maple Streets (Gleason, p. 33), behind the former Armour's facility. 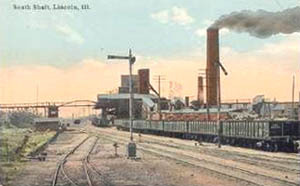 The South Mine was destroyed by fire that began October 21, 1917 (Gehlbach, When Coal Was King, fall, 1997, p. 1). Photo from Dooley, ed., p. 39. The same photo also appears in Paul Gleason's Lincoln: A Pictorial History, p. 119, where its location is identified as Tremont Street, and the house is described as a dormitory used by Lincoln College in 1903. 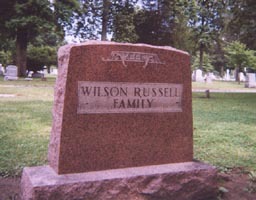 I have no "hard" evidence that the Wilson Russell Family stone marks the grave of Mr. Frorer's black employee mentioned above, but presume this to be the case ("You cannot go to the cemetery and ask to be enlightened on matters of this kind [questions of human relationships]" Ancestors, p. 207). The stone has no other information and sits alone in an area of several hundred square feet. This is one of the largest areas in this cemetery without other markers. Obviously, numerous other members of the family are buried here, and descendants wanted to commemorate their forebears' final resting places. The distinctive red granite marker serves that purpose well. 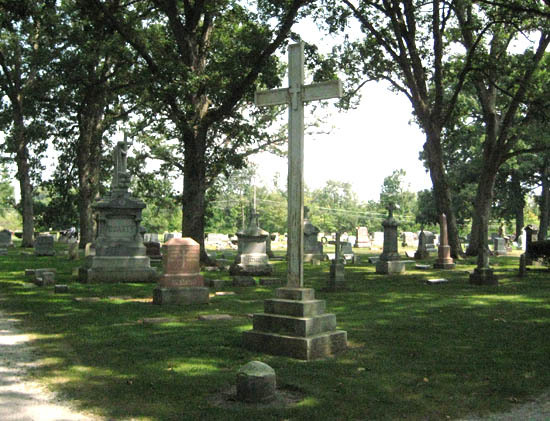 Holy Cross Cemetery is situated between Old Union and New Union Cemeteries. The original Route 66 alignment ran between Old Union Cemetery and Holy Cross Cemetery. The 1940 Route 66 alignment, still in use, runs between Holy Cross and New Union Cemeteries. German Catholics rest in St. Mary's Cemetery, a couple of miles west of this location on Fifth St. Road. 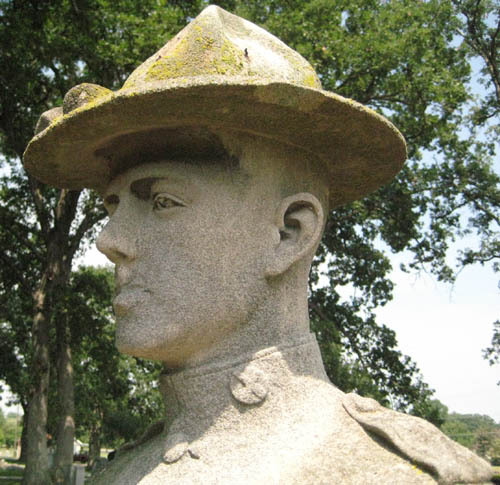 Holy Cross Cemetery has the only statue in Lincoln, Illinois, that honors a veteran of World War I. Lincoln has a statue of a Union Civil War soldier on the northwest corner of the Logan County Courthouse lawn. Lincoln has no statues commemorating the veterans any other of this nation's wars. 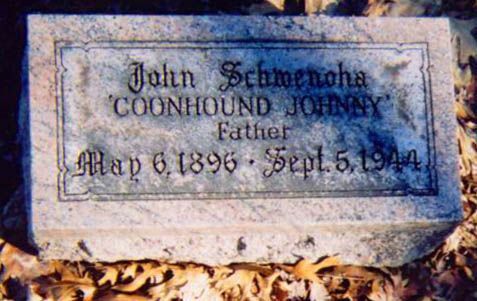 Below are the gravestones of William Maxwell's father and stepmother, Grace McGrath Maxwell, as well as Coonhound Johnny, the most infamous bootlegger of Logan County, Illinois. William Maxwell writes that his father bought Coonhound's product (So Long, See You Tomorrow, p. 18). For the story and photos of Coonhound Johnny's roadhouse, see http://findinglincolnillinois.com/wateringholes.html#coonhound. 15. South Kickapoo Street. Connecting Lincoln Lakes area to the Logan County Courthouse Historic District. 20. Lincoln Sportsmen's Club. Warning: Private property consisting of pond and shooting range. 22 & 25. Site of former Lincoln Lakes & Beach. Private property. For more information, including photos, see 28. Mining Coal, Limestone, & Sand & Gravel; Lincoln Lakes; & Utilities. 23. Routes 4 & 66 original alignments and surviving pavement. More information at 12. Route 66 Map & Photos Showing Salt Creek & Cemetery Hill, Including the Highway Bridges, GM&O Bridge, Madigan State Park, the Old Dam, & the Pig-Hip Restaurant in Broadwell. 24. 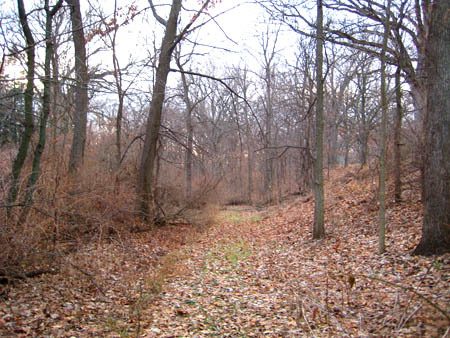 Edward R. Madigan State Park (formerly Railsplitter State Park). More information at 12. 26. Rocky Ford Road. For information about Rocky Ford, see 1. Abraham Lincoln and the Postville Courthouse. For information about the Pig Hip Restaurant and its legendary founder, Ernie Edwards, see 12. 28. Salt Creek. More information at 12. Map & Photos of Route 66 at Salt Creek & Cemetery Hill, Including the Highway Bridges, GM&O Bridge, Madigan State Park, & the Old Dam. Dooley, ed. The Namesake Town: A Centennial History of Lincoln, Illinois. Lincoln, Illinois: Feldman Print Shop, 1953. 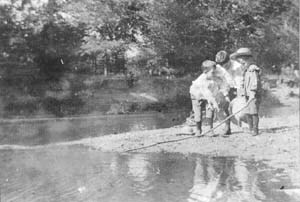 Fish, Henry R., assisted by T.E. Perry. Photos by A.B. Bliss. Illustrated Lincoln. Lincoln, IL: The Star Publishing Company, 1916. Gehlbach, Nancy Lawrence. "Chautauqua Summer." Our Times, vol. 3, no. 2, summer, 1998. Sam Redding, Publisher. Prairie Years Press. 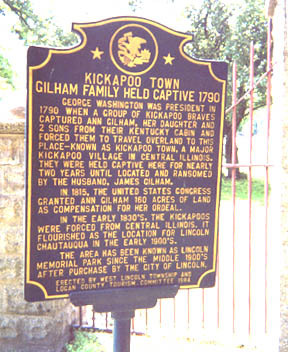 121 N. Kickapoo Street. Lincoln, IL 65656. ___________. "Water Works." Our Times, vol. 4, no. 2. summer, 1999. ___________ . "When Coal Was King." Our Times, vol. 2, no. 3, fall, 1997. Gleason, Paul E. Lincoln, Illinois: A Pictorial History. St. Louis, MO: G. Bradley Publishing, 1998. Material from Mr. Gleason's books is copyrighted with all rights reserved. Mr. Gleason's material used in this Web site is with permission from the G. Bradley Publishing Company, 461 Des Peres Road, St. Louis, MO 63131. Call 1-800-966-5120 to inquire about purchasing Lincoln, Illinois: A Pictorial History (1998) (200 pages of rare photos and text) or Logan County Pictorial History (2000) (also 200 pages of rare photos and text). Visit http://gbradleypublishing.com/. Maxwell, William. Ancestors: A Family History. NY: Vintage Books, 1971. ___________ . Billie Dyer and Other Stories. NY: Alfred A. Knopf, 1992. ___________ . The Folded Leaf. NY: Vintage Books, 1945. ___________. "The Trojan Women." All the Days and Nights: The Collected Stories. NY: Vintage Books-Random House Inc., 1995. ___________ . Time Will Darken It. NY: Vintage Books-Random House, Inc., 1948. William Maxwell's works are available at www.amazon.com and www.barnesandnoble.com. 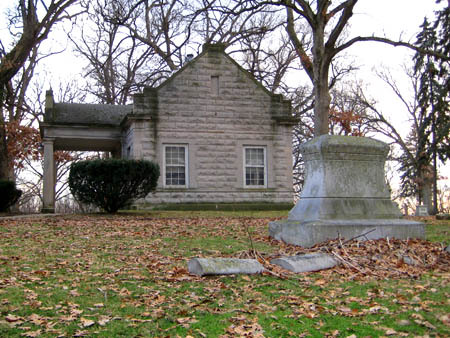 Political Graveyard of Logan County, Illinois: http://politicalgraveyard.com/geo/IL/LO.html#CEM. 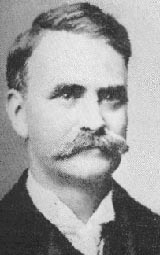 This Web site has biographical information about Richard J. Oglesby, John Gillett Oglesby, Judge Lawrence B. Stringer, and Edward R. Madigan. Judge Stringer is buried in Old Union Cemetery. US Secretary of Agriculture Madigan is buried in Holy Cross Cemetery. Shroyer, Larry. "Natural Disasters and Otherwise," in Paul Beaver, History of Logan County, 1982. The Logan County Heritage Foundation. Dallas, TX: Taylor Publishing Company, 1982. Also please email me if this Web site helps you decide to visit Lincoln, Illinois: DLHenson@missouristate.edu .